Our unit research interests include energy conversion/storage, and efficient light emitting, with energy building as a concept. Towards the goal of efficient energy conversion, we investigate the fundamental properties (atomic scale) of organic-inorganic hybrid perovskite materials, to guide the design of efficient photovoltaic devices (macroscopic scale) by surface/interface science. The second step for energy conversion will be its storage with efficient lithium-ion batteries, which also rely on the design of electrode/electrolyte materials and optimal design of interface. In the meantime, energy-sustainable lighting technology is being developed. In this year, we successfully push one step forward of our feature technique-chemical vapor deposition (CVD)-toward Cs based stable perovskite solar modules. With the surface/interface design, the performance of our solar cell devices is improved with high stability. We also design a stacked-graphene coating as solid-electrolyte interphase film for lithium-ion batteries. 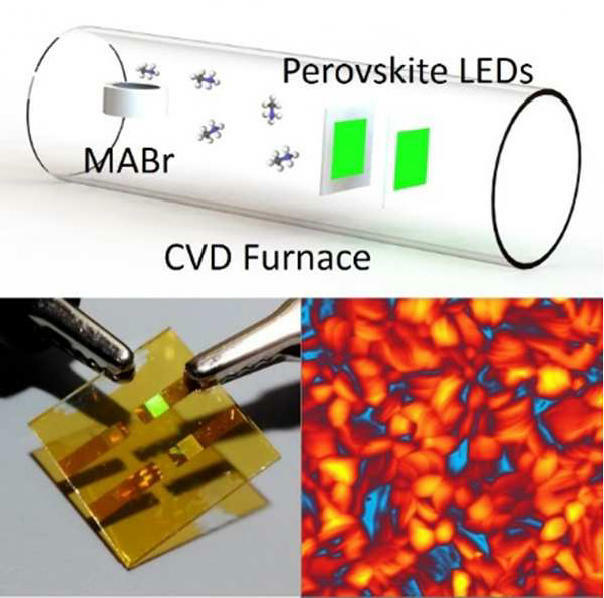 Furthermore, our feature technique of CVD for perovskite has been demonstrated for efficient light emitting diode fabrication. During this year, we organized three international symposiums focusing on energy science and technology (ES1—Perovskite Solar Cells—Towards Commercialization, 2017 MRS spring meeting; ES01—Perovskite Materials and Devices—Progress and Challenges, 2017 MRS fall meetng; International Symposium on Energy Science and Technology 2018). Among the three syposiums, one was held at OIST (ISEST 2018) by inviting experts from all over the world. And these symposiums provided great opportunities to present our research work and also to communicate/discuss with international experts. Fabrication of high performance OFETs. Low-Cost Hole-Transport Material for Perovskite Solar Cells. Prof. Prashant Sonar, Queensland University of Technology Brisbane, Australia. Prof. Chihaya Adachi, Kyushu University, Japan. 3.1 Review papers on stable and scalable perovskite solar cells/modules from active layer material and charge extraction layer design. Luis K. Ono, Nam-Gyu Park*, Kai Zhu*, Wei Huang*, Yabing Qi*, "Perovskite Solar Cells—Towards Commercialization" ACS Energy Lett. 2, 1749–1751 (2017). Mikas Remeika, Yabing Qi*, "Scalable solution coating of the absorber for perovskite solar cells" Journal of Energy Chemistry 27, 1101-1110 (2017). Luis K. Ono, Yabing Qi*, "Research Progress on Organic-Inorganic Halide Perovskite Materials and Solar Cells" Journal of Physics D: Applied Physics 51, 593001 (2018). To push the perovskite photovoltaic technology towards commercialization, we studied the fundamental properties and fabrication techniques as parallel lines. We studied the basic properties of each stack inside a perovskite solar cells, especially for perovskite materials, from atomic scale. And reviewed the composition and properties of perovskite materials and hole transport layer, with mixed cation perovskite holds the potential for higher stability. Also the various scalable coating of perovskite films has been reviewed, with a focus on the scale-up of size and stability measurement. Figure 1: (Left cover page) Reviews the various aspects of spiro-MeOTAD including its properties, additives, stability, alternatives, its applications in perovskite solar cells as well as other applications. 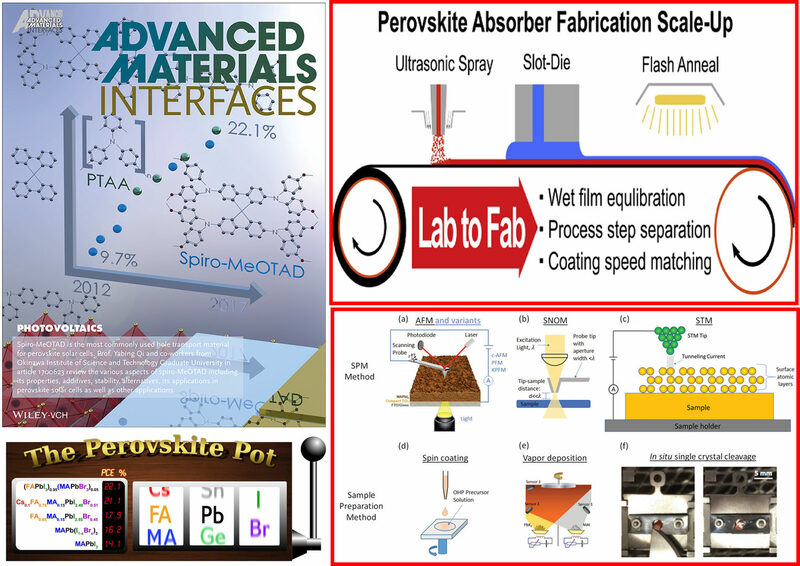 (Right top one) reviews issues specific to large area coating need to be considered when transiting from laboratory fabrication to low-cost, high-throughput production of perovskite solar cells. (Left bottom) reviews the design of mixed cation perovskite for stable and efficienct solar cells. (Right bottom one) the latest studies on organic–inorganic halide perovskites using scanning probe microscopy methods such as atomic force microscopy, scanning tunneling microscopy, and scanning near ﬁeld optical microscopy are reviewed. 3.2 Scalable fabrication of perovskite solar cells/modules by chemical vapor deposition and flexible devices by slot-die coating. Yan Jiang, Matthew R. Leyden, Longbin Qiu, Shenghao Wang, Luis K. Ono, Zhifang Wu, Emilio J. Juarez-Perez, and Yabing Qi*, "Combination of Hybrid CVD and Cation Exchange for Upscaling Cs-Substituted Mixed Cation Perovskite Solar Cells with High Efficiency and Stability" Adv. Func. Mater. 28, 1703835 (2018). 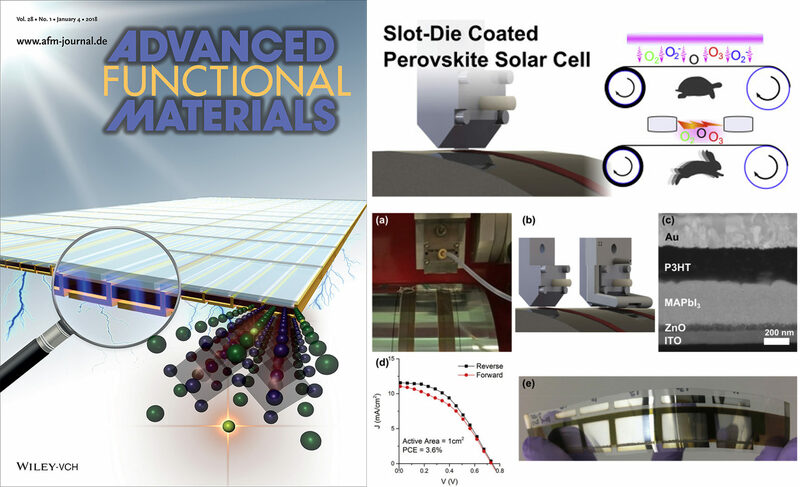 Mikas Remeika, Luis K. Ono, Maki Maeda, Zhanhao Hu, Yabing Qi*, "High-throughput surface preparation for flexible slot die coated perovskite solar cells" Organic Electronics 54, 72–79 (2018). Mixed cation hybrid perovskites such as CsxFA1−xPbI3 are promising materials for solar cell applications, due to their excellent photoelectronicproperties and improved stability. Here, a method to fabricate CsxFA1−xPbI3 by performing Cs cation exchange on hybrid chemical vapor deposition grown FAPbI3 with the Cs+ ratio adjustable from 0 to 24% is reported. The champion perovskite module basedon Cs0.07FA0.93PbI3 with an active area of 12.0 cm2 shows a module PCE of 14.6% and PCE loss/area of 0.17% cm−2, demonstrating the significant advantage of this method toward scaling‐up. This in‐depthstudy shows that solar cell devices show not only significantly increased PCEs but also substantially improved stability, due to favorable energy level alignment with TiO2 electron transport layer and spiro‐MeOTAD hole transport layer, increased grain size,and improved perovskite phase stability. To achieve industrially viable fabrication process for perovskite-based solar cells, every process step must be optimized for maximum throughput. We present a study of substituting laboratory-type UV-Ozone surface treatment with a high-throughput Corona treatment in a scalable perovskite solar cell fabrication process. It is observed that water contact angle measurements provide insufficient information to determine the necessary dose of Corona or UV-Ozone treatment, but the surface carbon signal measured by x-ray photoelectron spectroscopy accurately identifies when surface contamination has been completely removed. Furthermore, we observe highly accelerated de-contamination of ZnO surfaces by UV-Ozone treatment. The effect can be explained by photocatalytic O2− ion generation indicating that UV-Ozone treatment is also applicable in high-throughput processing. Figure 2: (Left cover) Up-Scaling Cs-Substituted Mixed Cation perovskite Solar Modules with High Stability and Efficiency up to 14.6%. (Right column) High-throughput surface preparation for flexible slot die coated perovskite solar cells. 3.3 Interface design for stable and efficient perovskite solar cells. Longbin Qiu, Luis K. Ono, Yan Jiang, Matthew R. Leyden, Sonia R. Raga, Shenghao Wang, and Yabing Qi*, "Engineering Interface Structure to Improve Efficiency and Stability of Organometal Halide Perovskite Solar Cells" J. Phys. Chem. B 122, 511–520 (2018). For the first time, we intentionally deposit an ultrathin layer of excess methylammonium iodide (MAI) on top of a methylammonium lead iodide (MAPI) perovskite film. Using photoelectron spectroscopy, we investigate the role of excess MAI at the interface between perovskite and spiro-MeOTAD hole-transport layer in standard structure perovskite solar cells (PSCs). We found that interfacial, favorable, energy-level tuning of the MAPI film can be achieved by controlling the amount of excess MAI on top of the MAPI film. Our XPS results reveal that MAI dissociates at low thicknesses (<16 nm) when deposited on MAPI. It is not the MAI layer but the dissociated species that leads to the interfacial energy-level tuning. Optimized interface energetics were verified by solar cell device testing, leading to both an increase of 19% in average steady-state power conversion efficiency (PCE) and significantly improved reproducibility, which is represented by a much lower PCE standard deviation. Interface engineering is also of importance for the fabrication of highly stable and hysteresis free perovskite solar cells. Here we report that a surface modification of the widely used TiO2 compact layer can give insight into interface interaction in perovskite solar cells. Three polymers, each with a different functional group (hydroxyl, amino, or aromatic group), are investigated to further understand the relation of interface structure and device PCE as well as stability. We show that it is necessary to consider not only the band alignment at the interface, but also interface chemical interactions between the thin interface layer and the perovskite film. The fact that a polymer interface layer on top of TiO2 can enhance device stability, strongly suggests that the interface interaction between TiO2 and MAPI plays a crucial role. Our work highlights the importance of interface structure and paves the way for further optimization of PCEs and stability of perovskite solar cells. Figure 3: (Left column) Interfacial modification of perovskite solar cells using an ultrathin MAI layer leads to enhanced energy level alignment, efficiencies, and reproducibility. (Right column) Engineering Interface Structure to Improve Efficiency and Stability of Organometal Halide Perovskite Solar Cells. 3.4 Methylammonium Lead Bromide Perovskite Light Emitting Diodes by Chemical Vapor Deposition. Matthew R. Leyden+, Lingqiang Meng+, Yan Jiang, Luis K. Ono, Longbin Qiu, Emilio J. Juárez-Pérez, Chuanjiang Qin, Chihaya Adachi, and Yabing Qi*, "Methylammonium Lead Bromide Perovskite Light Emitting Diodes by Chemical Vapor Deposition" J. Phys. Chem. Lett. 8, 3193–3198 (2017). Organo-lead-halide perovskites are promising materials for optoelectronic applications. Perovskite solar cells have reached power conversion efficiencies of over 22%, and perovskite light-emitting diodes have recently achieved over 11% external quantum efficiency. To date, most research on perovskite light-emitting diodes has focused on solution-processed films. There are many advantages of a vapor-based growth process to prepare perovskites, including ease of patterning, ability to batch process, and material compatibility. We investigated an all-vapor perovskite growth process by chemical vapor deposition and demonstrated luminance up to 560 cd/m2. Figure 4: Methylammonium Lead Bromide Perovskite Light Emitting Diodes by Chemical Vapor Deposition. 3.5 Stacked-graphene layers as engineered solid-electrolyte interphase (SEI) grown by chemical vapour deposition for lithium-ion batteries. In this study, a multi-layer of stacked-graphene (8 layers of basal planes) grown by chemical vapour deposition (CVD) is introduced as an artificial solid electrolyte interphase (SEI) layer onto a transition metal oxide cathode for lithium-ion batteries. The basal planes are generally regarded as a strong physical barrier that prevents lithium-ion diffusion, although it is believed that a small number of lithium-ions can migrate through the defect sites of the stacked layers. Interestingly, the unique design of the stacked-graphene perpendicular to the basal planes not only effectively suppresses the formation of instable SEI layers, but also achieves a reasonable amount of battery charge capacities. To correctly understand the impact from the stacked design, we further studied the rate kinetics difference between slow cycles (0.125 C→0.250 C→0.400 C→0.125 C) and rapid cycles (C→2 C→3 C→C). We propose that the clap-net like design of the stacked-graphene could enable the effective conducting pathway for electron transport, while protecting the active material inside. The magnetic measurements reveal the efficient Li+ (de)intercalation into graphene-layers. The artificial SEI also renders the electrode/electrolyte interface more stable against dynamic rate changes. The present approach provides a particular advantage in developing high stability battery that can be utilized at various charge rates.. Figure 5: Schematics of stacked-graphene coating on the Li(Ni1/3Mn1/3Co1/3)O2 (NMC) cathode, and difference in the charge rate kinetic at graphene defect sites and the electrode interface. Taehoon Kin, Matthew R. Leyden, Luis K. Ono, and Yabing Qi*, "Stacked-graphene layers as engineered solid-electrolyte interphase (SEI) grown by chemical vapour deposition for lithium-ion batteries" Carbon 132, 678–690 (2018). Qijing Wang, Emilio J. Juarez-Perez, Sai Jiang, Longbin Qiu, Luis K. Ono, Toshio Sasaki, Xinran Wang, Yi Shi, Youdou Zheng, Yabing Qi*, and Yun Li*, "Spin-Coated Crystalline Molecular Monolayers for Performance Enhancement in Organic Field-Effect Transistors" J. Phys. Chem. Lett. 9, 1318–1323 (2018). Zhifang Wu, Sonia R. Raga, Emilio J. Juarez-Perez, Xuyang Yao, Yan Jiang, Luis K. Ono, Zhijun Ning, He Tian, and Yabing Qi*, "Improved Efficiency and Stability of Perovskite Solar Cells Induced by C=O Functionalized Hydrophobic Ammonium-Based Additives" Adv. Mater. 30, 1703670 (2018). Zafer Hawash, Sonia R. Raga, Dae-Yong Son, Luis K. Ono, Nam-Gyu Park*, and Yabing Qi*, "Interfacial Modification of Perovskite Solar Cells using an Ultrathin MAI Layer Leads to Enhanced Energy Level Alignment, Efficiencies, and Reproducibility" J. Phys. Chem. Lett. 8, 3947–3953 (2017). Hong Duc Pham, Zhifang Wu, Luis K. Ono, Sergei Manzhos, Krishna Feron, Nunzio Motta, Yabing Qi*, and Prashant Sonar*, "Low-Cost Alternative High-Performance Hole-Transport Material for Perovskite Solar Cells and Its Comparative Study with Conventional SPIRO-OMeTAD" Adv. Electron. Mater. 3, 1700139 (2017). Juan Bisquert*, Yabing Qi, Tingli Ma, Yanfa Yan, "Advances and Obstacles on Perovskite Solar Cell Research from Material Properties to Photovoltaic Function" ACS Energy Lett. 2, 520–523 (2017). Luis K. Ono+, Emilio J. Juárez-Pérez+, and Yabing Qi*, "Progress on Novel Perovskite Materials and Solar Cells with Mixed Cations and Halide Anions" ACS Appl. Mater. Interfaces 9, 30197–30246 (2017). (+ equal contribution). Speaker: Prof. Zijian Zheng , Institute of Textiles and Clothing, The Hong Kong Polytechnic University, China.